Author List: Sabin Zahirovic, Nicolas Flament, Dietmar Müller, Maria Seton, Mike Gurnis. 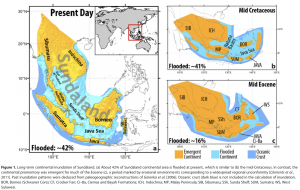 The Sundaland continental promontory, as the core of Southeast Asia, is one of the lowest lying continental regions, with half of the continental area presently inundated by a shallow sea. The role of mantle convection in driving long-wavelength topography and vertical motion of the lithosphere in this region has often been ignored when interpreting regional stratigraphy, including a widespread Late Cretaceous-Eocene unconformity, despite a consensus that Southeast Asia is presently situated over a large-amplitude, dynamic topography low resulting from long-term post-Pangea subduction. We use forward numerical models to link mantle flow with surface tectonics, and compare predicted trends of dynamic topography with eustasy and regional paleogeography to determine the influence of mantle convection on regional basin histories. A Late Cretaceous collision of Gondwana-derived terranes with Sundaland choked the active margin, leading to slab breakoff and a ∼10-15 Myr-long subduction hiatus. Slab breakoff likely resulted in several hundred meters of dynamic uplift and emergence of Sundaland between ∼80 and 60 Ma, and may explain the absence of a Late Cretaceous-Eocene sedimentary record. Renewed subduction from ∼60 Ma reinitiated dynamic subsidence of Sundaland, leading to submergence from ∼40 Ma despite falling long-term global sea levels. Our results highlight a complete ‘down-up-down’ dynamic topography cycle experienced by Sundaland, with transient dynamic topography manifesting as a major regional unconformity in sedimentary basins.